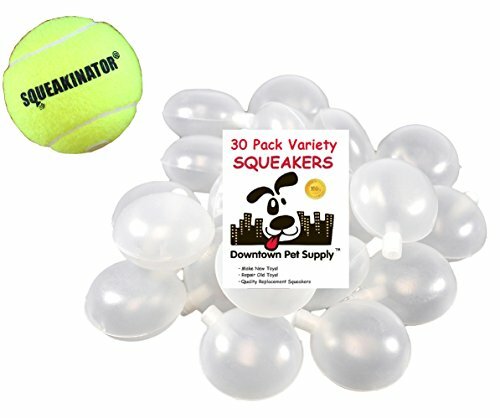 Downtown Pet Supply 30 Replacement Squeakers, Variety Pack (10 Medium, 10 Bellowed, and 10 Large Squeakers) + FREE Tennis Ball that SQUEAKS, THE SQUEAKINATOR by Downtown Pet Supply at Animal Lovers Center. MPN: 30variety. Hurry! Limited time offer. Offer valid only while supplies last. Use your 30 replacement squeakers to repair those old plush dog toys or your kid's toys. Make your own dog toys, teddy bears, children's toys, etc. Use your 30 replacement squeakers to repair those old plush dog toys or your kid's toys. Make your own dog toys, teddy bears, children's toys, etc. These are super squeakers for making toys of all kinds. Great value for fundraisers, make dog toys for your local dog shelter, dog rescue or any number of fundraisers. Plus your dog gets to enjoy The Squeakinator (The Original Tennis Ball that Squeaks!) Your dog will go wild over the Squeakinator, this is a real tennis ball that squeaks, only from Downtown Pet Supply. + FREE SQUEAKINATOR, the Original Tennis Ball that Squeaks!